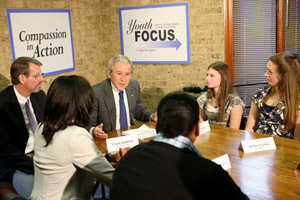 Outgoing President George W. Bush showed his inner “community organizer” on Tuesday by praising the volunteers who mentor the children of people who are incarcerated. President Bush appears in recent weeks to be on a farewell tour, trying to salvage his tattered ratings by reminding people of some of the charitable initiatives he launched as president. On Monday, he spoke about his efforts to battle the AIDS epidemic—an effort that even his most bitter rivals praise. And today, he tried to remind Americans that he initiated and funded an effort in 2003 to help children of people in prison. About 2 million children and youth in the United States have at least one parent in a Federal or State correctional facility, according to Bureau of Justice Statistics. These kids don’t just have to deal with separation from their parent, but must struggle with the economic, social, and emotional burdens associated with their parent’s incarceration. At the same time, research shows that mentoring programs aimed at this group can make a big difference, reducing their first-time drug and alcohol use, improving their academic performance, and reducing the likelihood that they will be involved in violence. Mentoring programs can also help them develop a trusting relationship with a supportive adult and provide them with a stable environment.